Employees and retirees of the Minnesota Department of Transportation, Department of Public Safety and Driver & Vehicle Services in Detroit Lakes held their 19th annual employee holiday potluck and fundraiser for Hospice on December 17. Each December, these agencies transform their lunchroom into a workshop of handcrafted and home-cooked items. Proceeds from the potluck have raised a total of $22,115 for Hospice of the Red River Valley since the event’s inception in 1995. Dana Hanson, Trudy Kordosky and Keven Meacham organize the annual event. 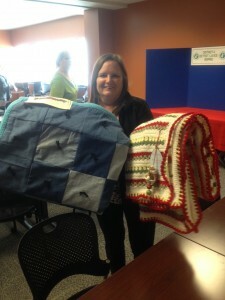 Current and former employees donate a variety of items for the potluck and drawing, many of them handmade. This year’s treasures included homemade salsas, pickles, cookies and caramel rolls, an antler wreath, poinsettia stained glass wall hanging, beaded jewelry, and afghans. Also, local merchants Webber Family Motors and KLN Family Brands donated oil changes and candy gift baskets as door prizes. Each year, the most highly coveted items are handmade memorial quilts. Bruce Bryngelson won the quilt made by Teresa Elkin in memory of her father-in-law, E. E. Elkin. Jane Butzer won the quilt made by Anna Boen in memory of her father, Eugene J. Meyer.